Those familiar with the Space Channel cult horror-comedy Todd & The Book of Pure Evil may remember the show ended its two-year run on a cliffhanger. Five years later, the resolution has finally arrived: As a feature-length animated film. Todd & The Book of Pure Evil: The End of the End starts shortly after the events of the series finale, in which relationships became strained and one of the main characters was killed off during the vanquishing of said book. The film doesn’t quite resets the story but reshuffles alliances and gives the student body of Crowley High new reasons to fear attending school. Quirky as ever, animation frees Todd‘s creative team to up the ante (two words: acidic acne). You don’t necessarily have to know the show to enjoy the film (a thorough recap is provided), but it enhances the experience. The comedy in display is a bit of an acquired taste. That said, those with tolerance for gore and gross-out humour are in the clear. 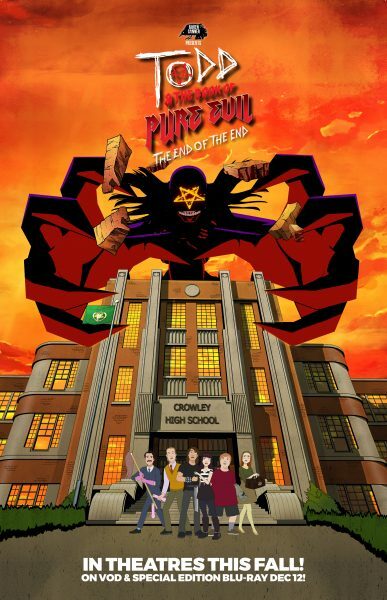 Todd & The Book of Pure Evil: The End of the End will play only tonight at 9.30 pm at the Roxy Theatre, with director Craig David Wallace and actor Alex House (Todd himself) in attendance.